DXDO-K900F fully automatic granule four-side sealing packing machine is suitable for packing loose, non sticky granule material in the pharmaceutical, food, chemical and other industry such as Pellet, monosodium glutamate, white sugar, Soup season, oatmeal, seed, coffee, cold powder etc. 1. Advanced performance, high strength, low noise, compact structure, stable operation and long service life, and the addition of a film body, for films and maintenance more convenient. 2. Synchronized using five-axis servo-driven, man-machine interface touch adjustment, controlled by PLC, it is precise in automatic in step positioning. Increase packaging speed premise to ensure the quality of packaging. 3. Using high precision rolling heat sealing roller as a whole as a seal mould sealing edges, exquisite bag-shaped flat sealing strong beautiful, good quality, high efficiency. 4. Easy and fast to adjust, it can step-less adjust Sachet length without changing the mould. Transverse and longitudinal seal, filling material, batch number, dash, cutting and other executive bodies can be adjusted through human-machine interface. 5. Packaging speed, filling precise metering. Reciprocating type feeding mechanism, which shirk responsibility structure, shake off assembling simple, easy cleaning and maintenance. Equipped with triangle measuring cup measurement, can be adjusted infinitely fine, high precision. 6. Photoelectric tracking system is adopted to ensure correct printing and with automatic counting function. 7. 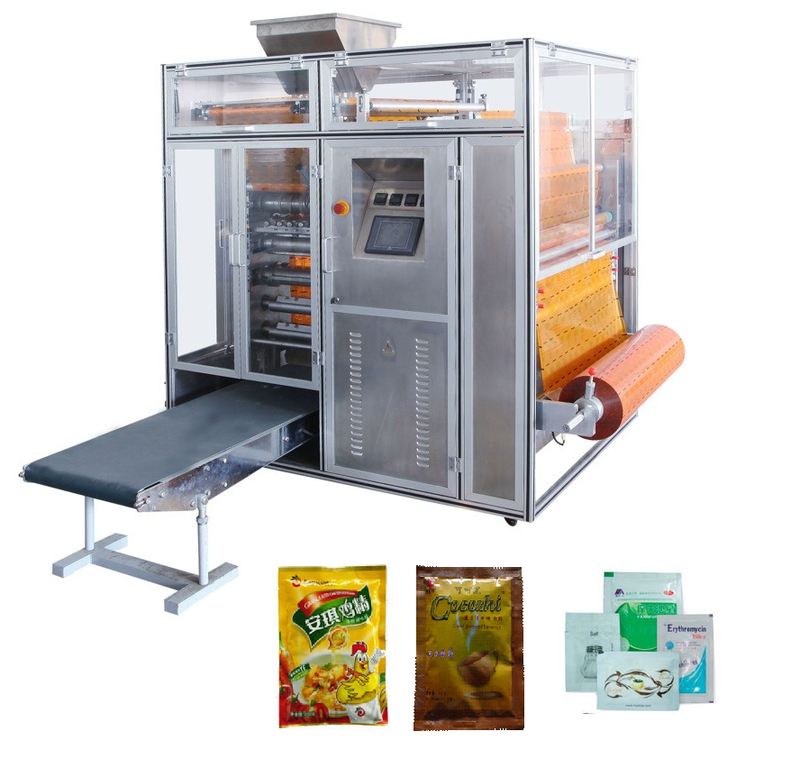 The machine with film automatic correction and damping mechanism, to ensure the straightness and tension stability of film, and make the Sachet more smooth and beautiful. 8. The model line additional membrane automatic deviation correction and line-film damping mechanism to ensure straightness of line film stability with the tension, thereby greatly improving the level of smoothness and beauty bag-shape. 9. Adaptability of the package film, the sealing temperature of machine is with automatic control, and has high control accuracy (± 1C °). Suitable for most complex film packing film in home and abroad, such as PET/AL/PE, PET/PE, NY/AL/PE, NY/PE and so on. 10. Extra functions set up, for example, sachet cutting can choose dotted line knife or flat cutting knife, abnormal shape knife etc, and can choose different kinds of alarm requirement.